Our weekly Move & Learn posts are among my favorites. I love finding new ways to play actively with my kids and sneak in a little learning too. This week I am sharing a simple addition crawling game for kids! Crawling helps build strength, balance, spinal alignment, and visual-spatial skills! At our house I like crawling activities because they require the kids to slow down a little bit and pay attention to how their bodies are moving. If they go too fast they wind up on their face! To play our addition crawling game you need... paper scraps, markers, painters tape, some counters (we used M&Ms), several chairs (or tables... or both), and two bowls for each participant. Prep-ahead: Before we got started playing the game, I wrote numbers 1-10 on scrap pieces of paper and then I taped a numbered paper underneath each chair or table around our house. Next I moved chairs around so that they were spread out all over our kitchen and family room. To play the game, the kids had to crawl around the house and look under chairs and tables and select two numbered pieces of paper. Once they found two numbered cards, they brought them back to our meeting spot and read the numbers aloud. Then they used counters to make each number. Once they demonstrated that they could show each number with counters, then they added the two numbers together (5+8=). My daughter (age 3) spent most of her time counting one number at a time while my son (age 5) spent most of his time adding groups of numbers together. Once they were done exploring with one set of cards, they crawled back to the chair, re-attached them, and then crawled around and found another set of cards to explore and started over again! If you don't like to use candy for math, just grab some pennies or any other little counters you have around the house. 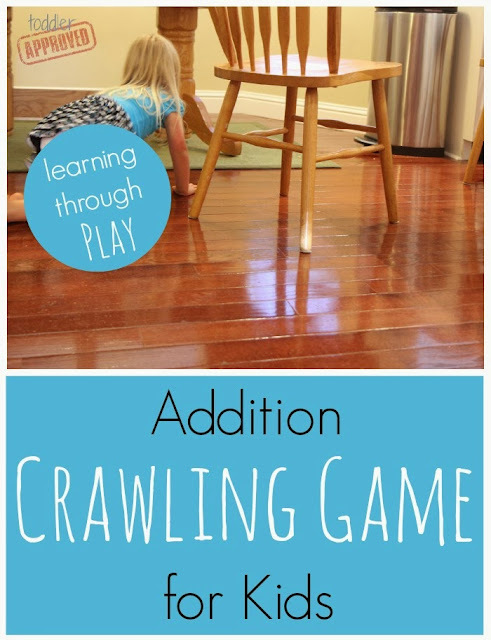 Our Addition Crawling Game for Kids is part of the Move and Learn Series that I am doing along with Hands On: As We Grow, The Pleasantest Thing, and Coffee Cups and Crayons. This addition crawling game is a simple way to practice number recognition, counting, and work on simple addition while also strengthening your muscles! Also, make sure you enter our Learning Resources Dinner Set giveaway! I love this creative approach to addition! We have a lot of chairs - this is definitely something to try. We love to see you linked up at After School! This is a great way to get kids moving and doing math. Thanks for linking up with After School. I am featuring this post this week!